Larxene's XIII Falling Price Deal! Get 7★ Larxene [+] within 5 draws from this Deal! This Month's XIII Falling Price Deal has arrived, featuring Larxene [+]! 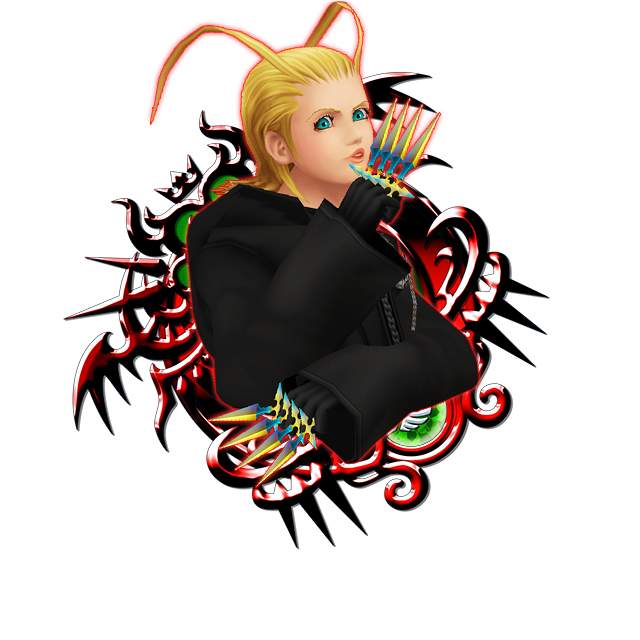 You can obtain Trait Medal #65 for Larxene [+] from this Deal, the NEW XIII Event, and the Medal Board! Deck out your Larxene [+] with traits and power her up further! ・A 7★ Larxene [+] within 5 draws! A 6★ version of Larxene [+] is also available from this Deal, but is not part of the "within 5 draws" feature. ・One Trait Medal #65 per draw! ・One 7★ Tier 7 Medal OR a 7★ Tier 8 Larxene [+] per draw! You also have a chance of getting a Boosted version of Larxene [+]! ・Boosted Larxene [+]: 1,000 more base Strength and Defense. 7★ Larxene [+] Medal Board! ★ The 7★ Larxene [+] Medal Board is here! For 5000 Jewels, unlock the limited-time 7★ Larxene [+] Medal Board, which includes one 7★ Larxene [+], three Trait Medal #65 medals, and more! Larxene's NEW Organization XIII Event! Face off against Larxene, but be warned - she gets stronger every time you defeat her! ・Each time you challenge and defeat Larxene she will grow more powerful, so be careful! ・Complete objectives to earn rewards, including a total of 5000 Jewels, and five Trait Medal #65 medals. ・Obtain Trait Medal #65 by defeating Larxene in certain quests to power up your Larxene [+] Medal with traits! Larxene [+] can be obtained from the Falling Price Deal and Medal Board! I finally got one of the game-end goals I have been working on since day 1 (when Unchained launched). Got both the board and the 5 pulls (I was saving jewels for month, I had an hefty 51k to deal with this), and now I'm happy like Christmas dropped two weeks before usual.